During our stay in Durban, we were able to visit CAPRISA - the Center for the AIDS Program of Research in South Africa - both in the heart of Durban and in Vulindlela, a large village located about 90 minutes west of Durban. CAPRISA is most famous for their preventive vaginal microbicide study of Tenofovir gel, a vaginal gel that was shown to reduce HIV transmission by 39%. This gel works as a Nucleotide Reverse Transcriptase Inhibitor (NRTI), meaning it blocks the HIV enzyme in charge of converting RNA to DNA. This was a huge step, considering there were really no preventive options against HIV (besides basics like using protection, etc) at the time. At Vulindlela, we discussed the Tenofovir study but also spent a long time discussing their clinic's focus on circumcision. Circumcision has been found to significantly reduce the risk of HIV transmission. CAPRISA offers circumcisions (for free) to men of all ages and also provides transportation to local schools so boys can get circumcised. Unfortunately, sometimes this can be a double-edged sword and can instill a feeling of immortality, of immunity, and not to use protection. But overall, it has been working well. 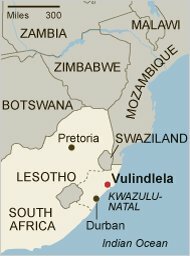 I am happy that you had a great time visiting Vulindlela and that you could learn a lot about the gel. Is it really true that the gel can reduce HIV transmissions by 39% ? Wow! I never knew something like that is even remotely possible. Could you please share more photos of the village?